National Society of Black Engineers, Washington DC Metro Area Professionals Chapter (NSBE DC) - NSBE DC Hip Hop Hooray Holiday! 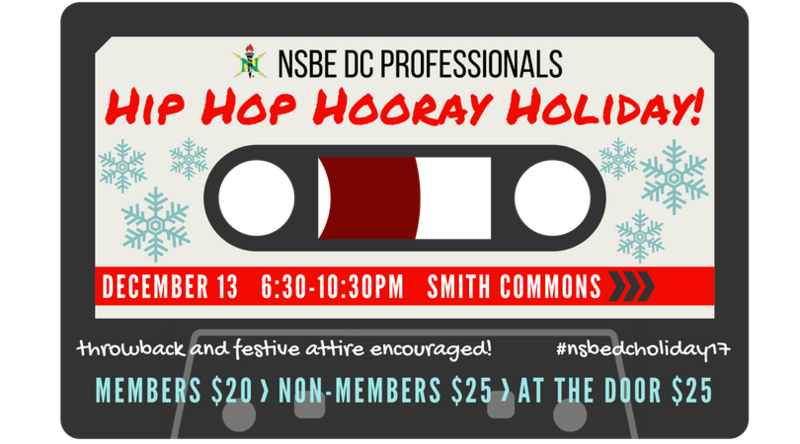 NSBE DC Hip Hop Hooray Holiday! Hip hop hooraaaaaay, ho ho hoooo! Get ready to vibe, connect, and sing along to your favorite throwback jams of the late 80s and 90s with your #NSBEDC family! Meet us at Smith Commons donned in your favorite throwback gear and/or holiday attire for our annual charity holiday party! We're raising money for kids to get involved in STEM! So come party with us for a GREAT cause! We've got you covered with food, roaming photography, and the popular DJ Marvalous spinning your favorite tunes, past and present, all night! *Transportation - Street parking available. Nearest metro is Union Station (Red line). Guests can use the free DC Streetcar to get to and from Smith Commons via the 13th st NE & H st NE stop every 10-15 mins. We can't wait to spread holiday cheer with you! Early arrival is suggested!